The perfect toy for an active dog. Doubles as a frisbee and pull toy to keep your pet entertained. 7" diameter cotton rope with polyester middle. 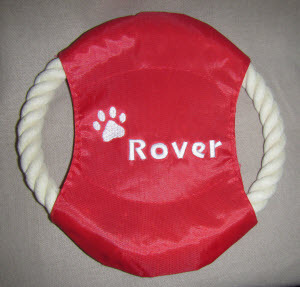 Embroidered with paw print and your pet's name, up to 15 characters. Embroidery done in white. Inspect pet toys frequently. Discontinue use if worn, loose, or tone pieces occur. Pictured with dog name "Rover"